Summary and Definition: The Haida were a seafaring people, skilled fishers and hunters who were located in the archipelago of Haida Gwaii (formerly the Queen Charlotte Islands) in northern British Columbia. The Haida tribe lived off the produce from the Pacific Ocean and constructed their plank houses and dugout canoes from the abundant Cedar trees. Many of the Haida people decorated their face and bodies with tattoos. Another fashion among the women of the Haida was the piercing of the lower lip for the wearing of a plug as an ornament. This article contains fast, fun facts and interesting information about the Haida Native American Indian tribe. Find answers to questions like where did the Haida tribe live, what clothes did they wear and what food did they eat? Discover what happened to the Haida tribe with facts about their history. The Haida people were organized into settlements and communities, rather than tribes. 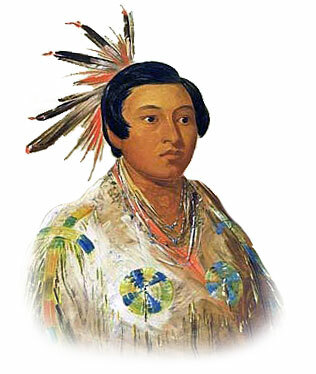 Haida society had three grades consisting of aristocrats, commoners, and slaves. Children born to slaves were also considered as slaves. The nobles proudly wore tattoos emblazoned on their chest, back, arms and legs with pictures of totem animals and family crests. One of the most common traditions of the Haida Tribe were the Potlatch Ceremonies which enabled the host to acquire or maintain prestige within their community. The villages of these tribes were almost always on the seashore and their houses were generally in one long line, all facing the sea. The beach in front of the Haida village would be covered with canoes dragged up on the sand. To keep warm in their damp climate, the Haida people oiled their bodies and sprinkled themselves with mica or red ochre. The Haida were one of the Northwest Indian tribes who erected Totem Poles. Totem poles were carved with animals that symbolized their guardian spirits who watched over the family, clan, or tribe. The mythical thunderbird is usually featured at the top of top of totem poles. Legend tells that this mighty bird captured Whale in its talons in exchange for a prestigious position on totem poles. The names of the other tribes who made Totem Poles included the Tlingit, Chinook, Bella Coola, Tsimshian and the Coast Salish. The Haida are people of the Northwest Coast cultural group. The location of the Haida tribal homelands are shown on the map. The main territory of the Haida tribe is the archipelago of Haida Gwaii (formerly the Queen Charlotte Islands) in northern British Columbia. Haida Gwaii means "Islands of the People". The geography of the region in which they lived dictated the lifestyle and culture of the Haida tribe. The Haida tribe lived in plank houses built from the red cedar trees that were so abundant in their location. The plankhouses were built over a pit and were almost square, measuring perhaps 40 or 50 feet on a side. There were no windows in the Haida plank houses but there were roof slots that let fresh air in, and smoke from cooking fires out. Many of the plank houses were adorned with totem poles and paintings that illustrated the dwellers clan, history or mythology. 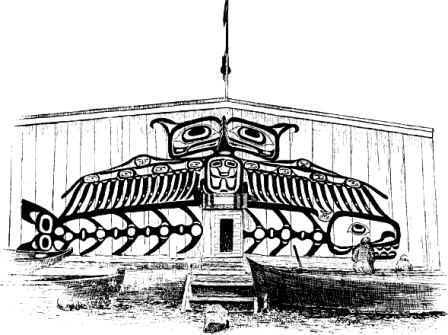 The picture shows the back of a Haida plank house depicting the legendary the thunderbird and the killer whale, reflecting aspects of the mythology of the Haida people (see the beliefs of the Haida below). The Haida canoes were "dugouts" of single tree trunks. The logs were cut in summer time and fire was used to char the wood to be cut away. After it had been partly cut out inside it was stretched or shaped by steaming with water and hot stones, and then putting in stretchers. The ornate bow and stern pieces were carved and added separately. Sometimes single-log dugout canoes were large enough to carry from 30 to 60 people. The Haida dugout canoes were often carved and painted at the ends. The paddles used in driving these canoes were slender and long-bladed, often painted with designs. The lightweight canoe was perfect for travel along fast streams and shallow waters and were sturdy enough for the rough waters of the bays and the Pacific Ocean. The clothes worn by the Haida were very similar to those worn by the Chinook Tribe - please refer to this article for comprehensive details. The women wore a type of kilt, or apron, of bark fringe across the front of the thighs and wore decorated bands around their ankles. The 'Chilkat' blanket was used on ceremonial occasions with shirt and leggings. The blanket was woven of mountain goat wool in bold colors and dramatic designs. During special ceremonies and rituals the Haida chiefs wore an elaborate head covering made of carved wood trimmed with shell and ermine. The Haida Tribe was one of the most famous tribes of Native American Indians. Discover the vast selection of pictures on the subject of the tribes of Famous Native Americans such as the Haida nation. The pictures show the clothing, war paint, weapons and decorations of various Native Indian tribes, such as the Haida tribe, that can be used as a really useful educational resource for kids and children of all ages. We hope you enjoy watching the video - just click and play - a great social studies homework resource for kids .